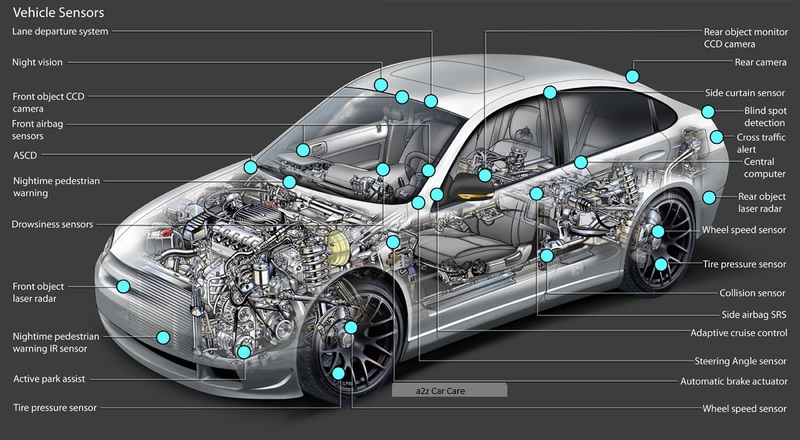 Understand your Car Sensors For better Performance of your Car. In the past the system were not centralized so the work was carried out mechanically or electromechanically and major issue faced was maintenance. However in early 90’s many changes came about one of which was Sensors. Your Car sensors acts as communicator between the internal issues in car and driver example Wheel pressure, oil pressure, coolant levels, temperature of various parts and provide précised Information. Its located in exhaust stream which monitors the content of exhaust gases for the proportion of oxygen. If it fails it can lead to more fuel consumption. It actually measures rotational speed of crankshaft in RPMs. Problem with Engine speed sensor could show up as cruise control as speedometer issues or possibly fuel and ignition problems. It is located near air filter and monitors the amount of air that enters the engine. The computer then ensures that engine takes right amount of fuel for smooth driving. If the sensor fails it results into poor running condition and fuel consumption. MAP sensors track vacuum at the intake manifold, which helps in determining engine load. The computer then uses this information to map out spark advance and fuel delivery. This sensor monitors the temperature of fuel. As warmer fuel is less dense and will ignite more readily, while colder fuel takes long time. Sensor ensures that fuel is injected at right temperature and speed so that engine can run smoothly. Mounted on the throttle shaft of the carburettor or throttle body, the throttle position Sensor (TPS) changes resistance as the throttle opens and closes. The computer uses this information to monitor engine load, acceleration, deceleration and when the engine is at idle or wide open throttle. The sensor’s signal is used to enrich the fuel mixture during acceleration, and to retard and advance ignition timing. This is an important sensor that manages the idling speed of car and ensures that this speed is increased or decreased as needed. Many more sensors are available and some which can be installed and can be part of your car. If you face any issues with your sensors and need help about any car related issues contact our experts. © a2z Car Care online.All Rights Reserved. Address : Viman Nagar, Pune, 411014.